Apple on Thursday took the unusual step of releasing a new video in its animated series for Earth Day 2017 —over a month after the actual holiday, but alongside an executive's appearance at an environmental connection in Detroit. Titled "Does my iPhone believe in reincarnation," the video features Apple's recycling robot, Liam, and three people from the company. These include director of Operations and Environmental Initiatives Sarah Chandler, VP of Environment, Policy and Social Initiatives Lisa Jackson, and finally another person from Operations and Environmental Initiatives, T.J. Tyler. The trio explain that the goal of Liam is to reduce the need to extract new materials from the ground by disassembling old iPhones, harvesting and sorting their individual parts. 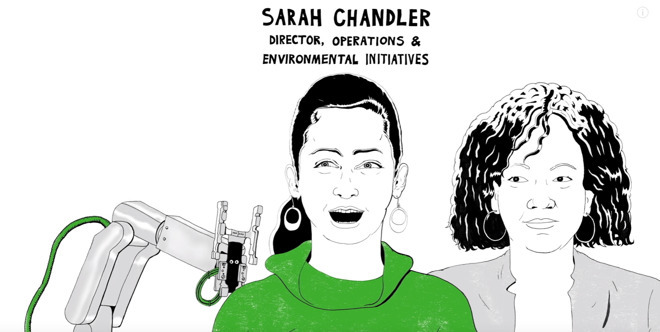 The video appears to be linked to Chandler's appearance today at the end of a four-day conference, Sustainable Brands Detroit, where she spoke about the concept of a "closed loop supply chain." The first round of Apple Earth Day videos was published on April 20, and covered topics like solar power, zero-waste initiatives, and even the company's use of artificial sweat to test wearables. Earlier that month the company set a long-term goal of recyling all of its materials —in a rare moment of public uncertainty however, it admitted that it's not sure how it will reach that point.